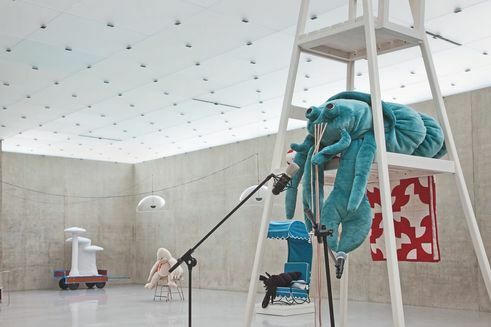 “Who’s Exploiting Who in the Deep Sea?” – the title of her latest exhibition is already formulated as a question and leads us directly into the idiosyncratically hermetic universe of the Cologne conceptual artist. 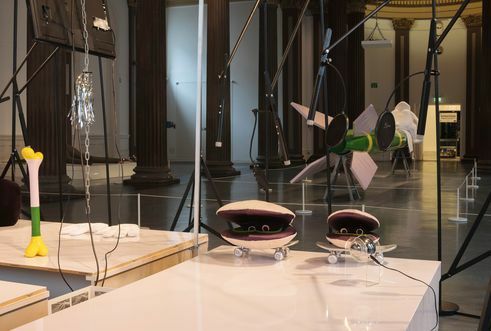 The installative mise-en-scènes of Cosima von Bonin make demands on a viewer who desires statements and messages; instead of these, they offer experiences and open up ranges of association. The unambiguous and didactic is repugnant to her. So too many a practice of a vain art business. She can wax vehement on the subject: “Curator, concept, project. These three words for me all belong to the war zone of art, to a war raging out there in which I deserted some time ago”, she said in 2016. 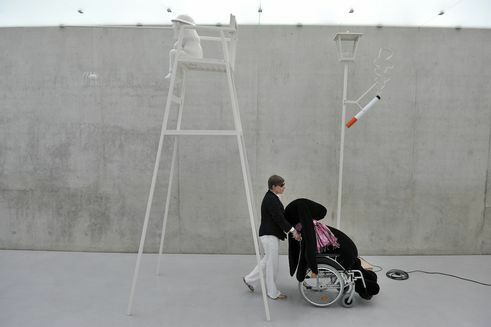 Born in 1962 in Mombassa, Kenya, Cosima von Bonin grew up in Salzburg. The academic education of the 2007 documenta artist remains unmentioned in her publications; in addition to her marriage to the artist Michael Krebber, among the sparse details vouchsafed of her personal biography are the intellectual milieu of the Cologne art and music scene and the oft-cited circle of friends, whereas from 1990 on her artistic vita impressively documents numerous solo and group exhibitions, film and video works and performances in Europe and later in North America. 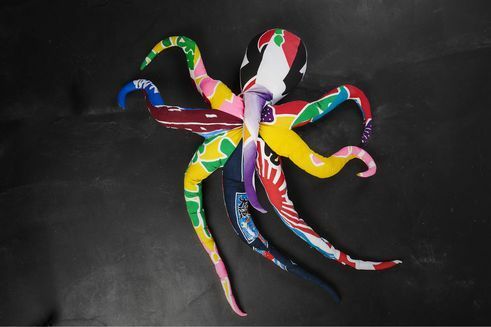 In accordance with the motto “We are many”, she often exchanges the role of individual star with that of master of ceremonies so as to create, with an ensemble of befriended artists from various genres, what the tireless author and theorist Diedrich Diederichsen once called “clique art works”. 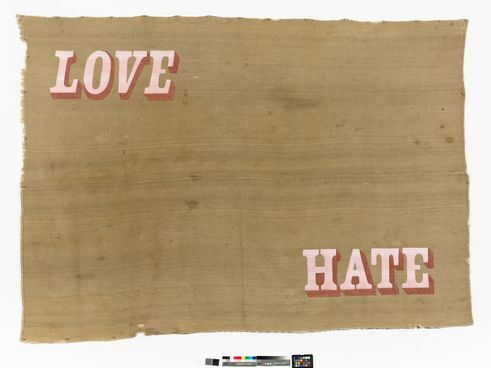 If, however, the basic biographical data make you think of the biting gestures of an artist associated with the Neue Wilde and the provocateur Martin Kippenberger, or visually transmitted noise levels of advanced pop and rock music, then think again. There are also no pugnacious statements on the gender debate or a clear position in post-colonial discourse to be had from von Bonin. Her aesthetic strategy is subtle: a monumentalizing of the cute veering into the grotesque. 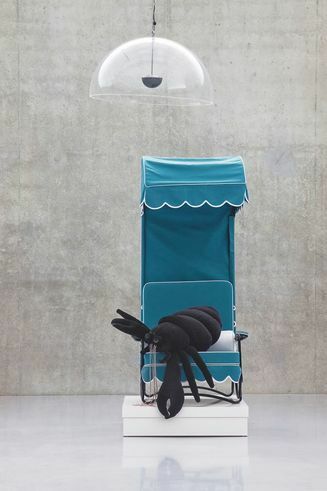 With her cuddly shark decorously tucked in at table and other monstrous marine plush animals and props, such as a children’s swing, a lifeguard’s chair, beach stalls and a gigantic bikini, von Bonin designs in her latest exhibition a parallel world. The props of “an underwater world and beach life” suffice to create the context and summon up inner worlds in the viewer. The precisely placed blank spaces must be filled in actively, for von Bonin spells out no stories in her installations. Relying on multi-layered references that cannot be unambiguously decoded, she evokes mood images. Various commentators have endeavoured to characterise the undertone of her work. They have spoken of fatigue and weariness, lethargy and indolence, melancholy and even a “stylistics of depression” (Manfred Hermes). Whether this is meant by the artist as a description or a criticism of contemporary society, however, must remain a moot question. Without pop art, conceptual art, Fluxus, minimal art, object art and the expanded concept of art of the 1960s, von Bonin’s creative resources and artistic conception cannot be understood. 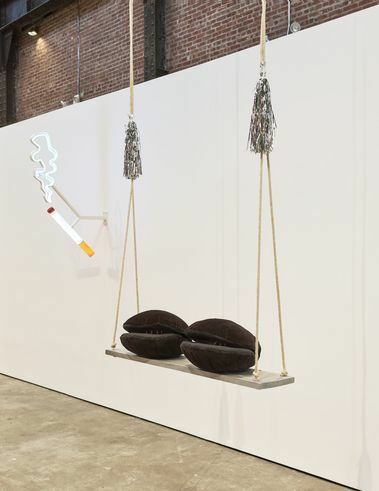 Close formal parallels of her soft sculptures to, for example, Dorothea Tanning, Claes Oldenburg and Mike Kelley might also be mentioned, but von Bonin’s approach refuses to submit to any clear classification. 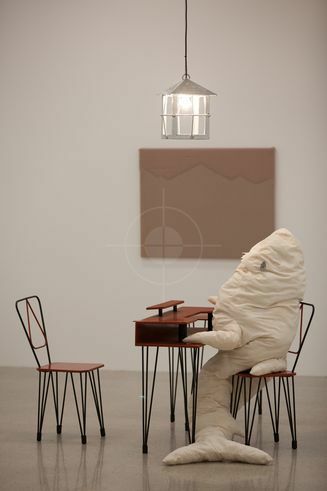 It is also an error to assign von Bonin to what is commonly subsumed under “textile art”, though fabric pictures and material images, which in many respects are reminiscent of Sigmar Polke and which she calls her “rags”, are part of her basic creative repertoire and plush toys are the distinctive mark of her work. But she is not interested in craftsmanship or gender-specific connotations. She has her material objects made by master seamstresses. With this logically outsourced authorship, she assumes ultimately a critical counter-position to that understanding of art which regards commodity aesthetics as incompatible with individuality. 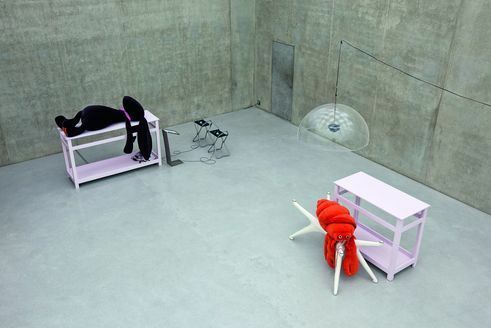 In 2013 the curator Uta Ruhkamp wrote in Textile Zeitenwende (i.e. Textile Turning-Point): “The embroidery, knitting, crochet and sewing needles have undoubtedly long since found their way out of the sphere of ‘feminist’ defiance art”. 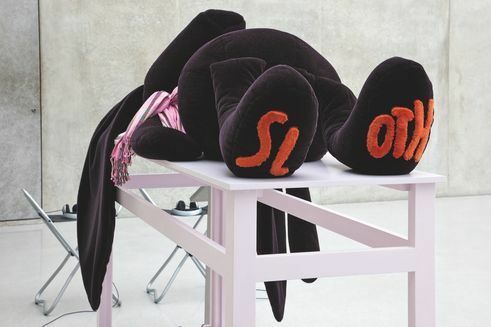 Now: “Techniques and materials are detached from their original ‘arts-and-crafts’ and ‘domestic’ contexts and serve the search for new forms of expression and aesthetics.” In this exploration, Cosima von Bonin is a true master. As part of the German contribution of “Germany @ Canada 2017” to the celebration of the 150th anniversary of the Canadian Confederation, Cosima von Bonin is presenting Who’s Exploiting Who in the Deep Sea?. 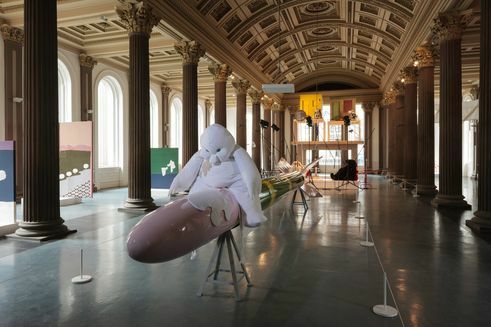 Following stations at the Gallery of Modern Art in Glasgow, Scotland, and the Sculpture Centre in New York, USA, the exhibition of installations with soft sculptures will be shown at the Oakland Galleries in Ontario beginning in March 2017. It will be complemented by performances by German and Canadian artists. Copyright: Text: Goethe-Institut, Isabel Rith-Magni. This work is licensed under a Creative Commons Germany Attribution – NoDerivs 3.0 Germany license.